We want to give you the best care possible, so we need to know a few things to make this happen. The patient forms will provide us with your health history and information regarding your condition. Dr. Dallas Cann will then meet with you to discuss your health-related problems and concerns, as well as potential treatment options. Our goal is to ensure complete chiropractic care, and Dr. Cann will develop a game-plan for your specific chiropractic needs. With your consent, Dr. Dallas Cann will perform a complete chiropractic exam measuring your reflexes and flexibility, and other tests regarding your neurological, orthopedic, postural needs. Depending on your specific condition, x-rays may be required to help us identify any serious spinal conditions and develop the most effective treatment plan for you. After the tests are performed, Dr. Dallas Cann will provide a detailed report regarding your specific chiropractic needs, recommendations, care timeline and cost. 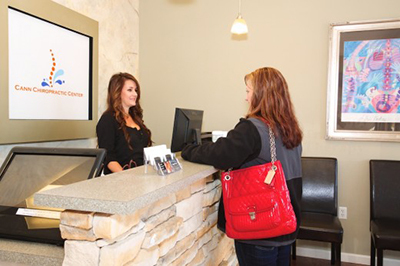 At the end of your appointment, you can choose to receive your first treatment. Depending on your specific needs, this may include spinal adjustments, physical medicine modalities and therapeutic procedures and/or soft tissue massage. Finally, Dr. Dallas Cann will give you specific recommendations regarding things you can incorporate into your treatment to accelerate recovery. These activities may include ice or heat application, activities or positions to avoid, and/or home exercises or stretches. At Cann Chiropractic we know that you are unique and so are your chiropractic needs.